I’m now 31 weeks pregnant which means in two months time there’s going to be a little bub in the house. Suddenly there’s a million and one things to do; painting, purchasing baby items, moving furniture around including relocating my husband’s study to the lounge room.. the list goes on. Fairly low down the list is the priority to make things. I have fabric and wool to whip up some simple quilts and rugs, but while I’m still working full time there just doesn’t seem to be enough time for craft while getting the house ready at the same time. So let’s call it an unintentional craft hiatus which I’m sure will be over in 5 weeks when my mat leave begins. In the meantime, I have been somewhat creative; we’ve just done a mini reno on our laundry cupboard which involved a coat of paint, relocation of some stupidly placed shelves that blocked the light and installation of lots of new shelves, railings and gadget holders. I’m so pleased with the result. My only regret is not having a ‘before’ photo. 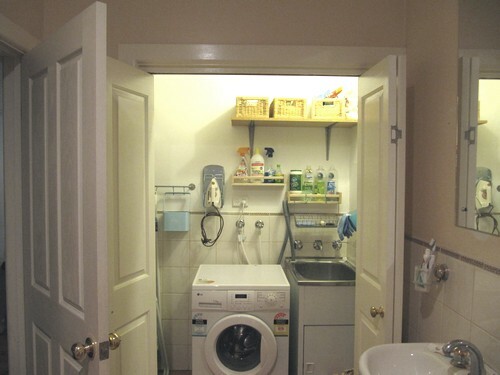 As you can see, our ‘laundry’ is actually located in a cupboard in the bathroom. None of the shelves you see were there previously and the walls were an interesting salmony pink. It’s so nice no longer needing to store the washing liquid on the floor and the iron on the washing machine! There’s storage space to the left where the vacuum cleaner, mop, duster etc live, along with a couple more shelves. The top one is holding some of my ridiculous amount of Christmas decorations. The rest of those are going under the house to make room for Col’s new study area.